In this follow-up book to his first volume Portrait Sculpting: Anatomy & Expressions in Clay, Philippe Faraut expands on modeling the human face in water-based clay featuring more than 100 new busts. 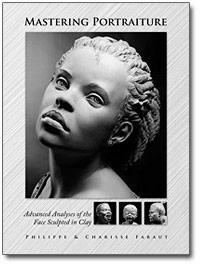 Designed for the advanced artist, this text utilizes nearly 600 photographs including 64 full-page images to analyze the requirements for capturing a likeness. Emphasis is placed on an in-depth study of facial anatomy critical in developing compelling expressions and bringing life to three-dimensional representations of the face. Additional studies are included to show successful treatments of hair and drapery, as well as the aging process. Studies of various sculpting styles. Techniques for analyzing planes of individual features. Discussions and comparisons of gender differences. Examples of different finishing options. Hardcover, Smythe sewn, 8 3/4” x 11 1/4”, 230 pages.